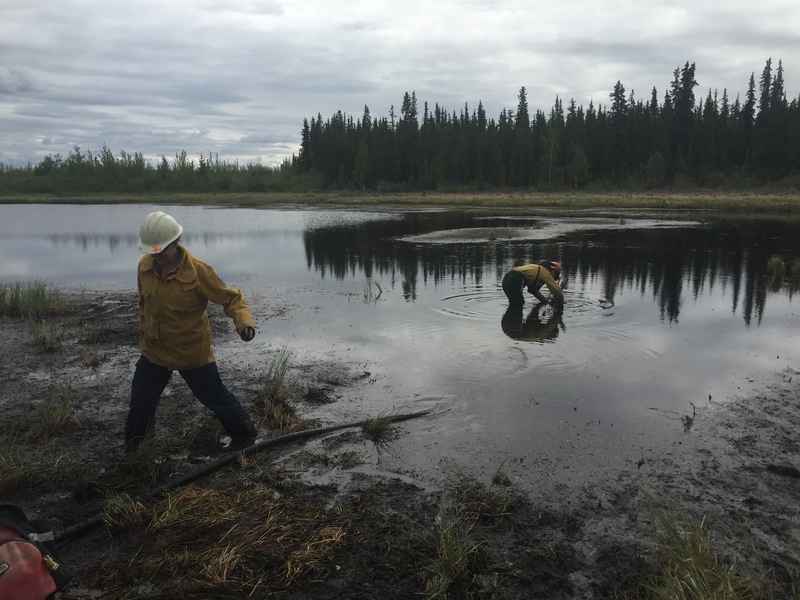 Alaska wildland firefighting history was recently made on the 818-acre Tetlin River Fire south of Tok when three women from the Alaska Division of Forestry, Copper River Area office formed what is believed to be the first all-female engine crew in Alaska. Carrie Hale, Ashley Dale and Jenny Moser spent 2 ½ days manning – pun intended – engine C-61 out of the Valdez/Copper River Area. 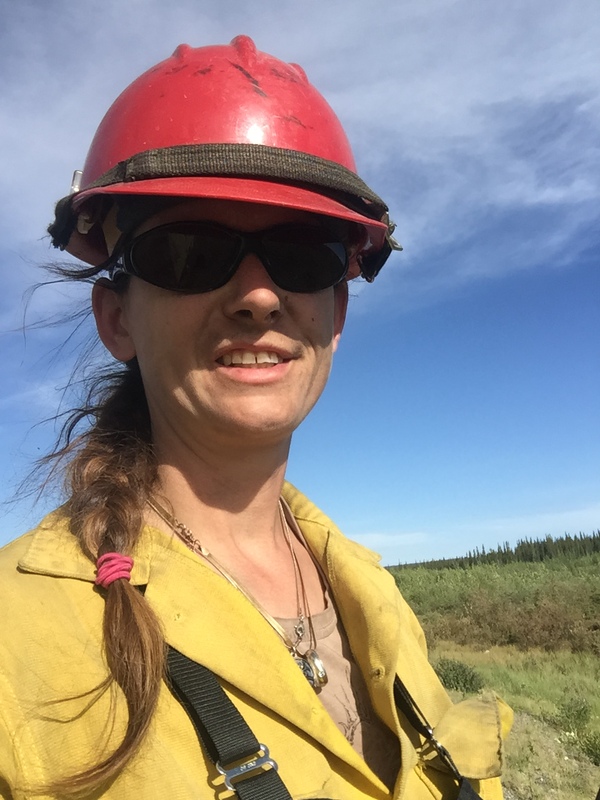 The fire started on Friday, June 17 and when Valdez/Copper River Area Fire Management Officer Gary Mullen asked Hale if she wanted to “roll an engine up to Tok, for intial attack,” Hale didn’t hesitate. The engine crew’s assignment was to hold the line in Division Tango where the fire had bumped into the airport, serving as an anchor for the Division of Forestry’s Pioneer Peak Interagency Hotshot Crew . “We mopped up the edge and ran the pump, so Pioneer Peak could bump ahead and cut line around the head of the fire,” said Hale, who works as a Statewide Training Officer for the Division of Forestry, but is a certified firefighter and engine boss, among other qualifications. The fact they were an all-female crew wasn’t lost on the other fire fighters, who were definitely more friendly than normal, Hale said. However, “nobody made a big deal about it”, she said. 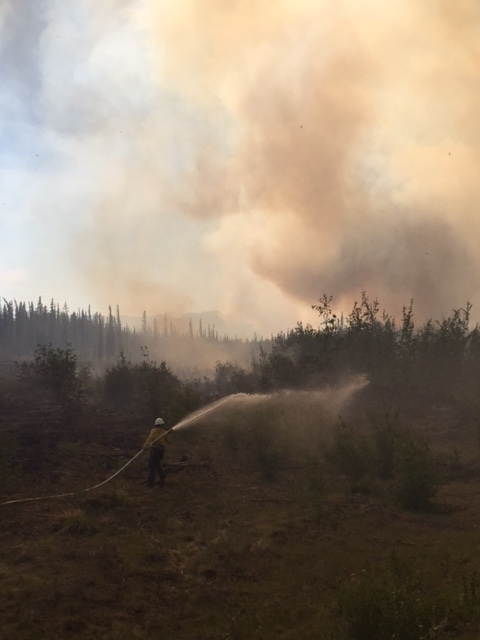 Hale has been fighting fire since starting as an emergency firefighter in Copper River in 2009. 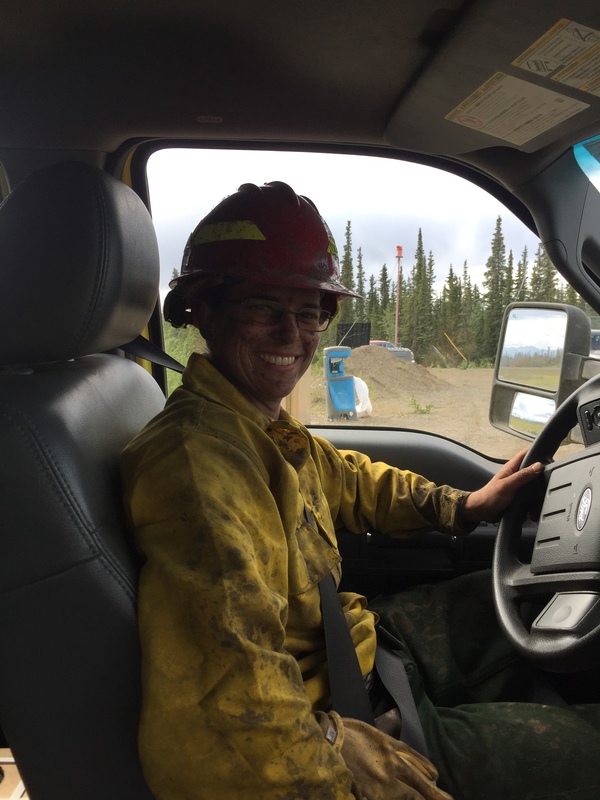 Dale is a 2014 graduate of the Alaska Advanced Firefighter Academy who started as an emergency firefigher (EFF) in Copper River in 2010 and has worked as a wildland fire and resource technician for the Valdez/Copper River Area the past two years. Moser is an Academy-sponsored short-term non-perm who earned her Red Card last year. Previously she was an elementary school teacher in Kaltag. This was her first firefighting assignment. 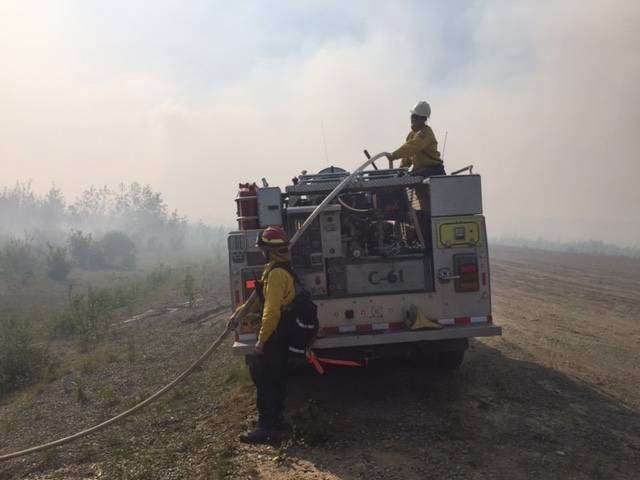 Jenny Moser, front, and Ashley Dale, on truck, man engine C-61 during the Tetlin River Fire near Tok two weeks ago.